I stumbled across a pretty cool project from Red Bull, called Street Art View. Street Art View is collaborative collection of places, that uses Google Street View to showcase street art from all over the globe. 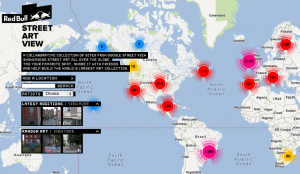 The site allows any user to tag spots they know of, share with friends and contribute to the collection of street art. Street art is something that we are obsessed with here at CityGrid. I feel street art is something that is uniquely local, and is a very important asset that any community can possess. As I travel around to different cities I will be taking pics of my favorite local street art, and share here. I may contribute some of my work to Street Art View, but I’d also like to create some sort of open source, local app that would empower local artists to capture, display and share the work from their communities. Let me know your thoughts, a feel free to share your local art with me @citygridapiteam. As I roam the country as the CityGrid API Evangelist, one of the things I will keep an eye out for is, Art! As I find it, I will share or ask the artist to share!